Game is NOW OUT on the APP STORE! Please support or spread the game if you can. Thankyou! I am on the verge of releasing a game called Steelbound Sky. 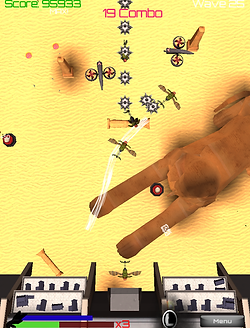 It's a game which is inspired by traditional shoot'em ups but is combined with a contemporary control scheme. Rather than taking control of a ship, you are in control of the wind. 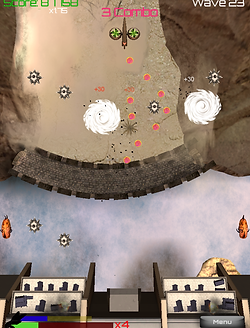 Wind streams are used to manipulate projectiles or enemies themselves. It's a game which takes advantage of touch controls rather than trying to retrofit analogue buttons or joysticks on a screen. It will soon be out now on the iOS store! I will update this post with the link in the next few weeks. Since this game is truly built for a tablet experience I recommend that it is played on an iPad. However, it is fully compatible with most iPhones/iPod touches. A PC version is working pretty well at the moment, and is being considered for release in the future. This game started off as a group post University Project. However What you see in terms of programming, enemy wave design and UI are all my work . Staring near beginning of last year it was pretty much a 1 man team. Enemy pattern designs, general ideas, environment design/placement, testing and assembling the game together are mostly my solo work. I had to outsource a lot of 3D content and music from places like the Unity store. I was able to do various 2D texture editing task such creating particle effect textures which is generally simpler. So I hope you understand why the art style may not seem that creative; I have a purely game programming background, had to split my time resources into every section of the pipeline and have minimum art skills. But it was interesting to have my hands directly engaged in every aspect of game development. I hope you give it a try soon and enjoy it. Please ask any questions or give any feedback/criticism. Last edited by witherwood on Sun Feb 28, 2016 12:51 am, edited 1 time in total. GAME IS NOW OUT ON THE APP STORE!!! Please support it if you can!!! 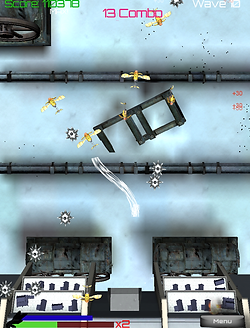 -Added new Replay Mode which allows player's to replay levels that have been beaten already. -Added option to allow players to play with unlimited continues. Limited continues is now called Arcade Mode. -Increased curvature of wind stream so players can now draw wide curves by default. I hope you all will have a chance to try out my game. Version 2.0.0 is NOW LIVE!